Yes, Microsoft Excel Is Talking to You » Accounting Advisors, Inc.
From time to time, you may need to compare a set of figures or text in an Excel spreadsheet to a paper document. Doing so can be time consuming and error-prone as you shift your attention between screen and paper. A better approach is to enable Excel's hidden Text to Speech feature. 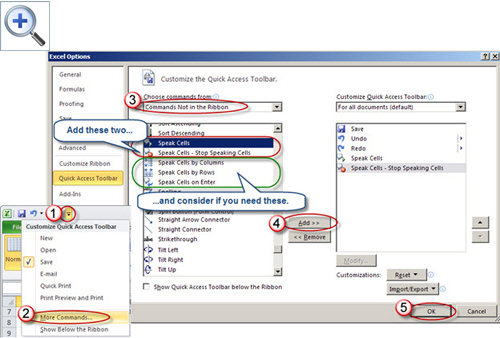 As shown in Figure 1, you can add the Text to Speech feature to the Quick Access Toolbar in Excel 2007 and later. If you're using Excel 2010 or later, you also have the option to add these commands to a custom group in your ribbon, but for purposes of this article, I'll focus only on the Quick Access Toolbar. At the end of this article, I'll provide alternate instructions for Excel 2003. Once you add the icons, the Text to Speech feature is simple to use. Simply select one or more cells, and then click the Speak cells icon. Excel then reads the numbers or text to you aloud with surprising clarity. 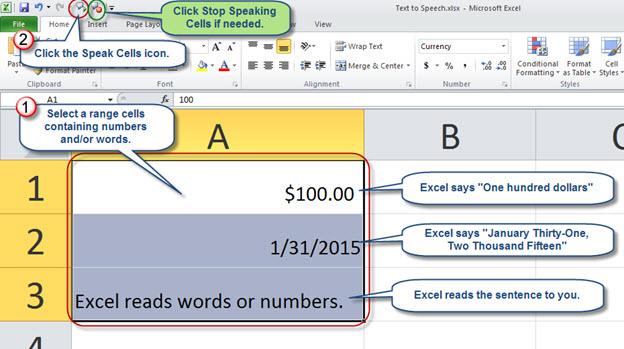 Figure 1: The Speak Cells icon instructs Excel to read numbers and/or text aloud. As shown in Figure 2, click the arrow at the end of the Quick Access Toolbar, which typically appears at the top of your Excel screen, above the Office button in Excel 2007 or the File menu in Excel 2010 and later, and then choose More Commands. When the Excel Options dialog box appears, choose Commands Not Shown in the Ribbon from the Choose Commands From drop-down list. Scroll down the list, click once on Speak Cells, and then click Add. To locate this command more quickly, click once on the <Separator> command at the top of the list, and then press the letter S. This will move you down the list near where Speak Cells appears. You can also skip the Add button by simply double-clicking the Speak Cells Command. Add the Speak Cells – Stop Speaking Cells command in the same fashion, and then click OK. 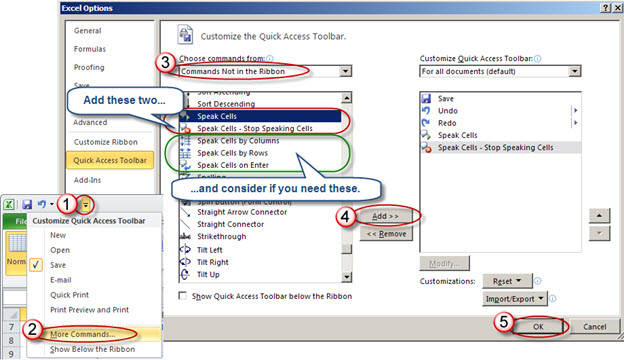 Figure 2: These steps show how to add the Speak Cells icons to your Quick Access Toolbar. To test your work, enter a variety of text and numbers in a range of worksheet cells, which you'll then select to highlight. 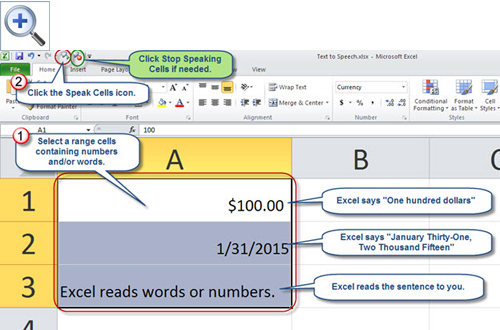 Click Speak Cells and listen while Excel reads aloud to you. Excel 2003 users can utilize this functionality as well. To do so, choose Tools, Customize, and then click on the Commands tab. Select Tools from the Categories list, and then drag Speak Cells to any existing toolbar or to the unused area to the right of the Help command. Carry out the same process for the Stop Speaking icon, and then click Close.